Andre Previn’s newly unveiled work, adapted from Tennessee Williams’ great play, A Streetcar Named Desire has been lavished with as fine a cast as can be imagined, perfectly suitable sets and lighting, and Maestro Previn himself in the pit. Alas, we must confess, we were left unmoved – as also must have been the many walkouts noted at this, the second performance. There are some lovely moments in the music, but the long stretches of uninspired recitative overwhelm the few genuine arias. 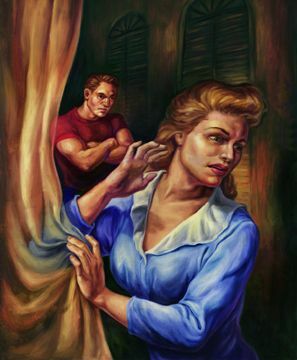 The key problem lies in the central role of Blanche DuBois. In the play, she is a highly vulnerable character, as well as a neurotic living in a world of boozy self deception. Blanche’s music in the opera does not convey vulnerability. As fine as her singing was tonight, soprano Renee Fleming, whom we admire greatly, seemed too strong, too grounded to be a convincing, dramatically appropriate Blanche. Consistent with this misinterpretation, stage director Colin Graham has Blanche walk off by herself at the final curtain, after she has declared, in one of the best known lines of stage literature, that she has always been dependent on the kindness of strangers. It would have rung far more dramatically true had she walked off leaning on the arm of the doctor. Whether the cause is the music (surely, at least, in part) or the stage direction (not the strong point of this production), or a combination of the two, the overall result lacks the emotional impact that makes the play so powerful still.